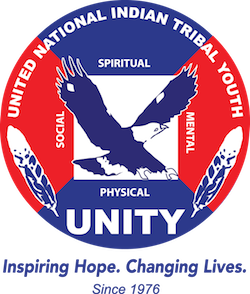 Earth Ambassadors visit Havasupai – UNITY, Inc. In May of this year, the 2017-2018 class of UNITY Earth Ambassador had the opportunity to visit the Supai Village located at the heart of the Havasupai reservation in the Grand Canyon in Northern Arizona. Supai is only accessible by hiking, horseback, or helicopter. Meaning, there are no roads for cars to travel on, yet there are thousands of tourist who visit this Grand Canyon destination from all over the world for its beautiful location and waterfalls. Like many reservations, tribes thrive on tourism as a staple to their overall economy. For UNITY’s Earth Ambassadors, this was an opportunity to learn about environmental stewardship through the observations of a community’s relationship with the environment. For a community so remote, this was great reminder of how important and delicate water is to a community. Water, for what brings tourism for its gatorade blue water falls, is also what sustains the community. The Earth Ambassadors has a chance to see materials coming into the community, such as a food and equipment, but more importantly how the community dealt with trash materials leaving the community. As technology helps deal with these issues, it was an eye opener to see how a community works to keep their environment clean to live and enjoy. Thank you to the Havasupai community for being welcoming to UNITY’s Earth Ambassadors.